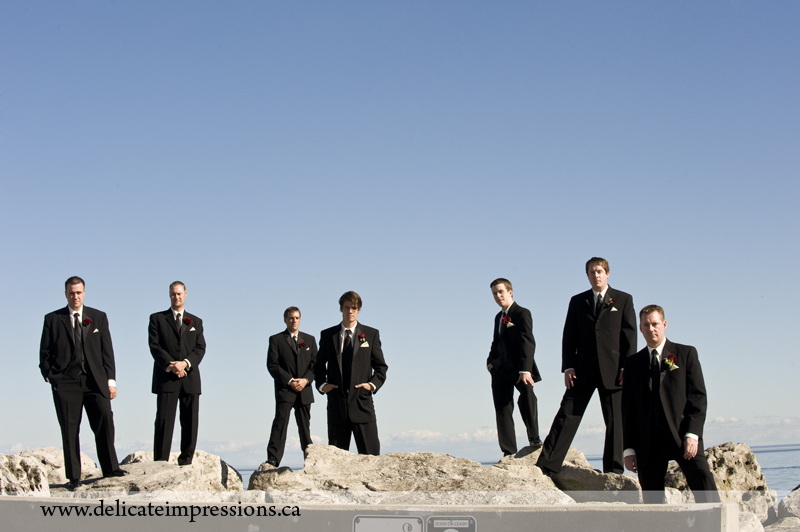 Wedding Photographer | Delicate Impressions Blog World! 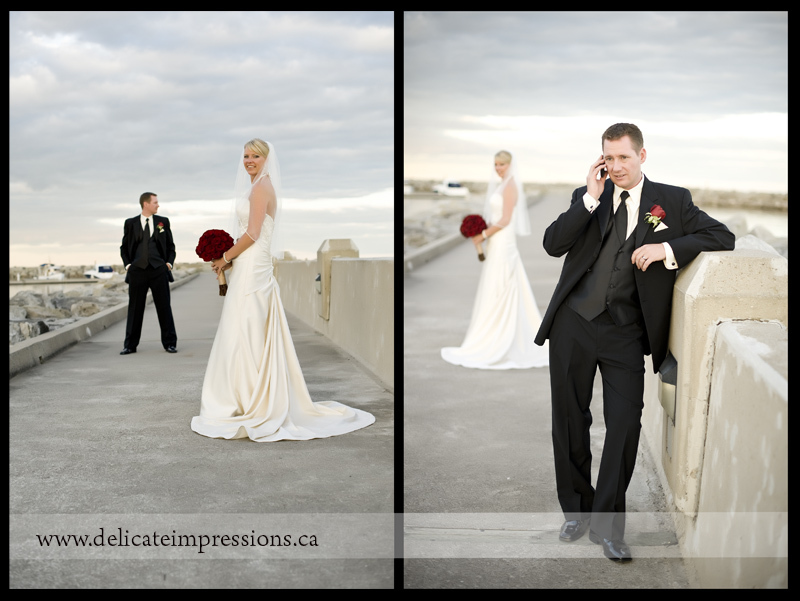 Friday September 10th was a beautiful day for the gorgeous Jen & Chad to “FINALLY” tie the knot! It was an evening wedding on the water in Oakville and the lighting and the sky were absolutely amazing as the perfect backdrop! Congratulations Jen & Chad! Thanks for such a fun evening – and a great first wedding breakdown dance! I love the colors chosen for this wedding…so classy! Lol…I LOVE THIS KISS SHOT! Look at the bottom of the picture! Then the celebration to end the official “I Do’s”….these two were AWESOME!!! Lol! Little story to this picture…we were seperated from the wedding party and due to the wedding being at sunset, we wanted to make sure that we got Jen & Chad first when the lighting was perfect…so when it was time to get the wedding party to join us, there was some texting going on and during this pose…well, Chads’ groomsman called his cell phone – and he answered! So not posed at all…he was actually talking on the phone ha! Like I said…the lighting, the sky, the sunset…and the couple made for some wonderful pictures! Enjoy guys and have a wonderful TWO WEEK HONEYMOON!! I’ll be in touch in a few weeks! Though I took “April off”…I still worked until late last night. But I’m now officially on vacation. I will not be answering phone calls or emails as I will not be in the area 🙂 Please leave me a phone message, or an email if you need to book a session for May. If you have your baby in the next couple weeks, please title your email with the date of your baby’s arrival and I will return emails as soon as I get back. If you have not heard from me between May 1st and 5th, please be patient as there will be a lot of catching up to do. All galleries will be down by May 1st so please have your orders placed by this date (to avoid extra fees for re-posting the galleries). Also, make sure to have your April contest entries in as the closing date for all entries is May 1st (some great entries already so keep them coming!). Have a great couple weeks and I’ll be in touch in May! God bless! From bad weather forcasts to good…back to bad…well we had a beautiful Saturday for this Venetian Club Wedding! Congratulations Veronica and Lucas and thanks for letting me be a part of your special day! June, you were GREAT to work with and I wish you all the best with the next wedding! Wow – 3 in one year YIKES! The famous window shot…we try and do a little something different with each one! Veronica had these awesome pink shoes to go with her dress! Love them!! Now a little story to go with the “dip” shot! We say to Lucas okay “now your going to dip her and give a nice kiss!”…and he says “Dip?” “The last thing I dipped was a nacho! OMGoodness we were howling! Tha’ts hilarious! And I love her veil!!! I love love LOVE it!! !